Weimar is a city located in the German Federal State of Thuringia and is perhaps best known for its contribution to the German Enlightenment. 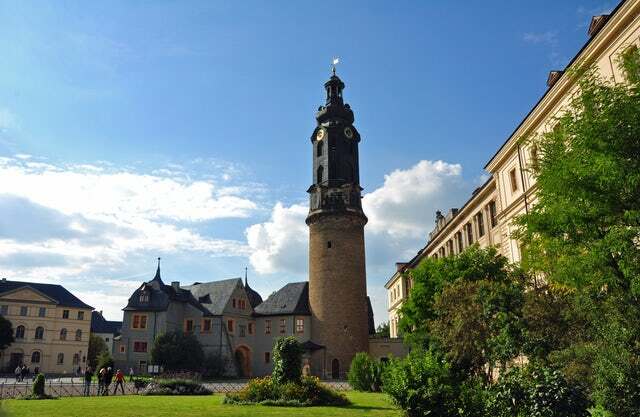 It is home to leading characters of the literary genre of Weimar Classicism as well as writers such as Johann Wolfgang von Goethe and Friedrich Schiller. Its large cultural heritage and historical importance makes it one of the must visit cities in Germany. Whenever you are in the city for business, or pleasure, or both, make sure you engage in at least one of the following activities. One of the fun activities to engage in while in this city is to visit its museums. Its top rated museums include the Goethe National Museum, Herzogin Anna Amalia Bibliothek, and Chateau of Belvedere. Of course everything made in German is high quality, but even the Germans have outdone themselves with this park. It has rich Germanic trees, well-trimmed grass, fountains, monuments, flowers, water ponds, hiking trails and a small river. If not for anything else, visit Weimar for Park an der Ilm. You will need to mix the side-splitting and bundle of laughter with something sedate and somber at the Buchenwald Concentration Camp. This is where the Nazi regime held the Jews and those who had a contrary opinion during the World War II. It is a cruel reminder that you should not take the peace and freedom that you enjoy today for granted. The combination of Giant trees, shuttered windows, and extra nice pavement make this building one of the most photographed houses in Europe. The fact that it is located on your way to Weimar's Old Town is a good incentive to pass over the house as you explore deeper into the Old Town. Your tour of the city cannot be complete without visiting the royal family's home. It features the renaissance tower that makes it even more alluring. The fact that it is next to Marktplatz and the Park an der Ilm makes it easy to access as you visit these other attractions. Weimar is indeed the place to go if you are looking for insights into the culture of ancient Germans. It is the best city in Germany to vacation with family.